The Imeptus GoGo Vaporizer is an innovative variable voltage cartridge battery system that houses and protects your 510 oil cartridge for discreet sessions on the go anywhere or anytime. It is equipped with an innovative 510 thread height slider that allows you to fully conceal your attachment (Up to 56mm tall) with removable silicone cap cover for stealthy and safe travel. Inside every kit there are two magnetic adapters that make connecting to the GoGo quick, reliable and easy. Attach one to an oil attachment of your choice measuring as large as 11.5mm in diameter and drop it into the Gogo for an instant connection. When the time calls for a session, slide your attachment entirely out of the housing and use the single control button to fire/make adjustments. If your cartridge is not connected and raised as far as it can go the Gogo will not allow it to fire or change power settings. Impetus incorporated an advanced 500mAh lithium-ion battery that will easily keep you going all day long after a full charge. 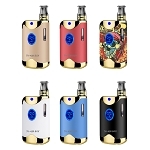 It has variable voltage output with four preset settings that range from 2.8V-4.2V. With such a wide output range you can expect to see some impressive results while using many different concentrated oil types. While the Gogo is powered on (Click 5X in 1.5s) rapidly press the power button 3 times to adjust your voltage control settings. Beneath the power button you have a 4 light LED indicator that helps you to monitor your output settings and battery life for a much more convenient experience. At the Gogo's lowest 2.8V setting the LED indicator will show just one light and every level increase it will add one additional light. To check your remaining battery life you can quickly press/release the button and after about a second the LED shifts to give you an idea of when you may need to recharge next. At a full 100% charge all four LED's are shown and at every 25% decrease one light powers off. You definitely won't need to worry about recharging too often but when the time comes it is as convenient as can be. Every Gogo Oil Battery as a retractable USB charging cable built directly into the device ensures you are always able to recharge everywhere you take your Gogo. 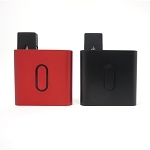 Invest in the Impetus Gogo Cartridge Battery today in two sleek color options and enjoy your favorite oils on the go efficiently and easily for plenty of time to come.